Access to this issue is FREE! Simply sign-in if you are already a member of the community or register now using the form on the right. 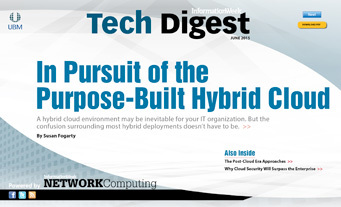 This is Network Computing's June Tech Digest on cloud technology. Access is free with registration in the InformationWeek community. Just register below. There's no cost, and it takes only a few minutes. Once done, click the "Go To Digital Issue" button at the bottom of the page. In Pursuit of the Purpose-Built Hybrid Cloud: A hybrid cloud environment may be inevitable for your IT organization. But the confusion surrounding most hybrid cloud deployments doesn't have to be. The Post-Cloud Era Approaches: Industry gurus predict a future where the cloud is simply how we all compute, evolving through practices like DevOps and containerization. Why Cloud Security Will Surpass the Enterprise: Speaking at Interop, Google's chief data center architect, Urs Hölzle, said cloud security will improve faster than enterprise security in the next few years. Terms of Service | UBM Privacy Statement | Copyright © 2015 UBM Tech, All rights reserved.